Three one acts by the renowned Italian author Mario Fratti to close the first Annual Italian Theater festival NY, directed by Kevin Albert. Mario Fratti has been writing for the theater since the ‘50s and has published over 90 plays. He has lived and worked in New York City since 1963, after catching Lee Strasberg’s attention at the Festival of Spoleto. He has taught at Columbia University and at Hunter College. His works have been translated into 20 languages and produced in 600 theatres all over the world. He had a long run on Broadway with his 1982 musical “Nine” (adaptation of his play “Six Passionate Women” – Life of Fellini – film “8 ½”) starring Raul Julia. The musical was revived on Broadway in 2003 starring Antonio Banderas. Fratti has won 33 theatre awards in Italy and 11 in New York City. 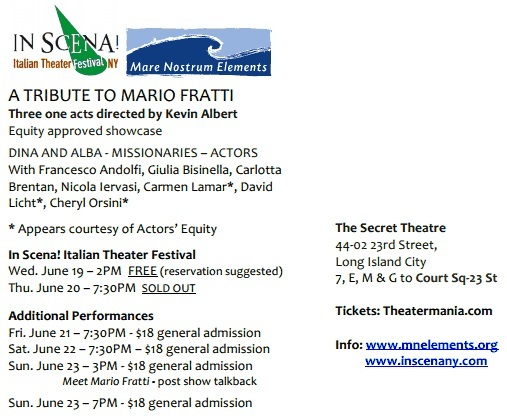 Mare Nostrum Elements was founded in 2001 by Italian performer Nicola Iervasi and American actor Kevin Albert. Since the beginning, Nicola and Kevin were committed to providing a nurturing and non-competitive environment for performers to explore different cultures and disciplines, producing both experimental and classic stagecraft. They have produced Off-Off and Off Broadway productions and have created the Wave Within!, to provide working performers, students, and young adults with more comprehensive performance tools.